HARRISBURG, N.C. – Pirelli World Challenge team CRP Racing has made significant off season changes to its motorsports program, today announcing the GT racing team will return to the series for 2017 with a new manufacturer and new driver. With the continued support of longtime sponsor Carlisle Companies, CRP Racing has taken purchase of the new Mercedes-AMG GT3, to be piloted by sports car racing veteran Ryan Dalziel. Earlier this month, Mercedes-Benz USA (MBUSA) and Mercedes-AMG announced the expansion of the customer racing program to the United States, confirming entries in the IMSA WeatherTech Sports Car Championship. CRP Racing is the first Pirelli World Challenge race team to announce purchase of the naturally aspirated, 6.3-liter V8 Mercedes-AMG GT3 race car. 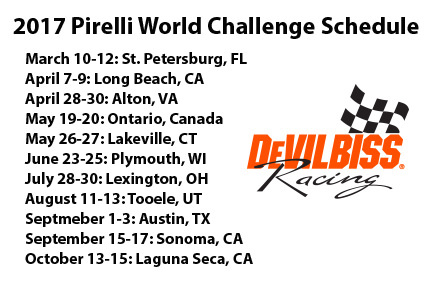 Ryan Dalziel joins the team with an extensive resume in Pirelli World Challenge, having finished third in the 2015 championship, despite missing three races due to schedule conflicts. In high demand, the Scot has spent the last two years dividing his time between full time rides in the IMSA WeatherTech SportsCar Championship, Pirelli World Challenge and the FIA World Endurance Championship. Carlisle Companies, owner of DeVilbiss, has been a long time sponsor of the team, and confirmed its continued support of the GT racing team for the upcoming season. Founded in 2008, CRP Racing has created a competitive racing program, earning 10 wins, 16 podiums and 33 top five finishes. The No. 2 DeVilbiss / CRP Racing Audi R8 LMS showed a strong program in 2016, with the season highlight of a double podium finish for driver Kyle Marcelli at Lime Rock Park. The approaching season begins March 10-12 at the Grand Prix of St. Petersburg in conjunction with the Verizon IndyCar Series. The eleven race weekend calendar will again visit some of motorsport’s most iconic tracks including Road America, Mazda Raceway Laguna Seca and the temporary Long Beach Grand Prix Circuit. For more information, visit world-challenge.com.